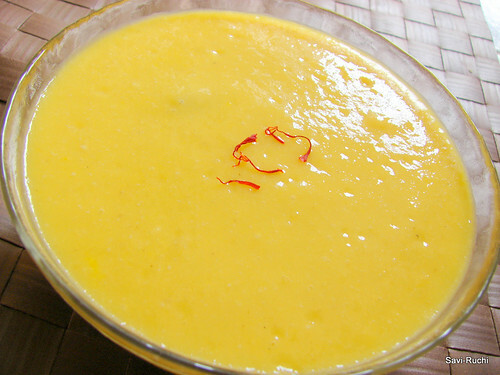 Mango seekarane/rasayana is a "popular" dish in many of the Kannadiga(people from Karnataka, India) house holds. During the mango season, this dish would be prepared atleast once (not just once though!) either as a side dish or a dessert. Mango seekarane/rasayana is a very quick, easy & simple dish that tastes great as a side dish with chapathis (Indian Flat bread) or pooris. Our family just love this dish with pooris & the left over seekarane/rasayana is consumed as a dessert, in no time !!! 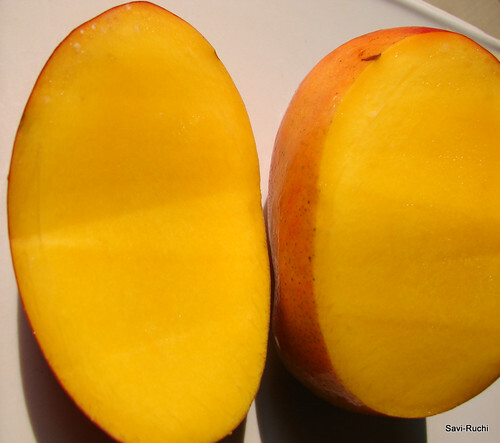 Peel out the skin & chop the mango around the seed. Discard the seed. Preserve a small cup of chopped mangoes. 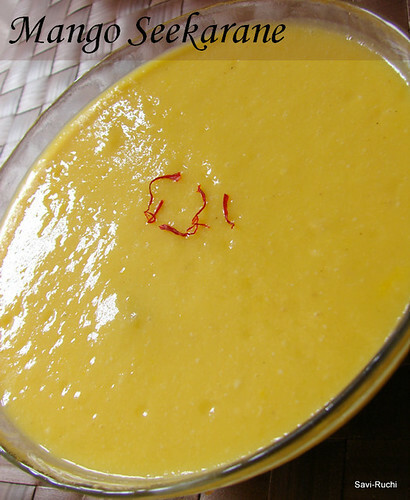 Scoop out the puree, add the remaining finely chopped mangoes & saffron. Serve chilled as a side-dish or dessert. Cashews are added to get the thickness to the seekarane. This could be avoided by more mangoes. Ripened bananas can also be used to thicken the seekarane. A vegan version of the same can be prepared using coconut milk. My mom-in-law prepares using coconut milk & that version is equally tasty. Sugar could be replaced with jaggery. You can do many changes with this dish, but the final result is always tasty & relished by everybody. Hah! !, after a long time I got a chance to send this dish to an event. This goes to "No-Cook" event hosted by PJ of seduceyourtastebuds. 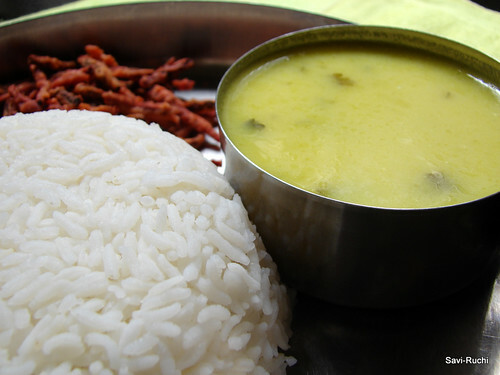 This dish is very close to kadhi prepared in Gujarat & Maharastra. 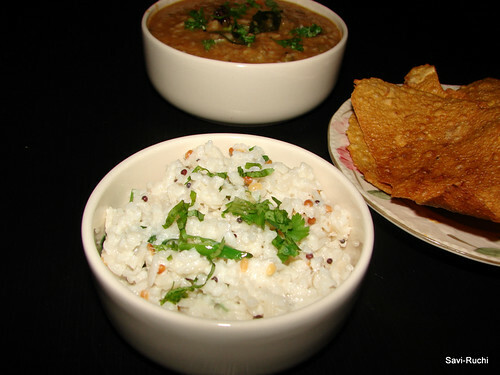 This is a very popular dish in North Karnataka. However, they make this dish very thick like a sambar using a lot of gram flour. 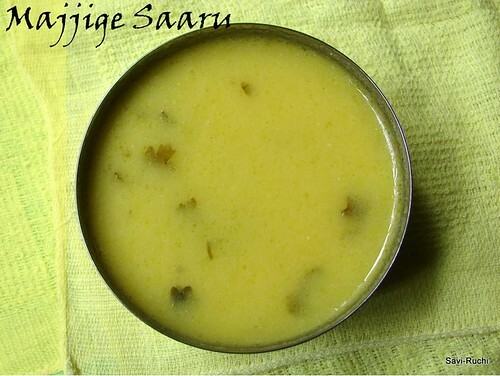 Infact, the thicker version of this saaru is majjige huli (mor kolambu/yogurt curry) for North Karnataka people. My atthe/bua (aunt) stays in Hospet & I got a glimpse of this dish there. Mix salt, gram flour to the buttermilk & mix thoroughly. Ensure no lumps are formed. Heat a medium pan. Add oil to it. When oil is hot, add mustard & cumin seeds. When mustard seeds splutter, add green chilli paste & curry leaves. Saute for 5-8 secs. Finally add asafoetida & turmeric. 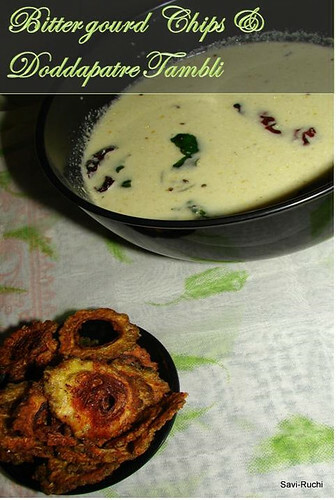 Pour the buttermilk mixture to the tempering & cook on a medium heat until the rasam/soup boils. Donot overcook. Turn off the flame as soon as the soup/rasam start to boil. Garnish this with coriander leaves & serve it hot with piping hot rice & chips/papad. Donot use thick yogurt or hung curd for this dish. If you fall short of buttermilk, add 1.5 cups of water to 1/2 cup thick yogurt & whisk it well to prepare the buttermilk. The rasam/soup tastes great if the buttermilk is slightly sour. Hence, use a day old buttermilk or keep it out from the refrigerator for few hours before using them. Udupi dishes use curry leaves & coconut in abundance. I may not be exaggerating when I say, there are very scanty dishes that do not call for these two. 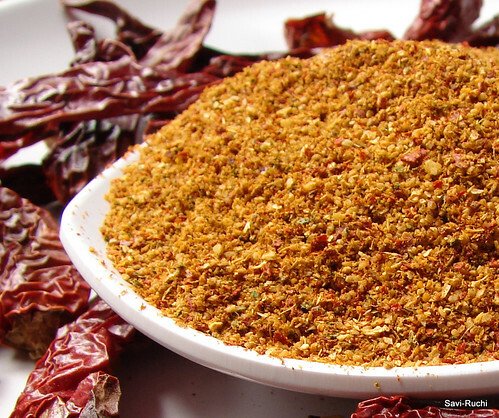 Udupi rasam powder recipe is no exception for it. Dry roast all the above ingredients(except asafoetida) one at a time until the raw smell disappears & a nice aroma is filled in the kitchen. Ensure not to burn any of the spices. Do not roast until the spice turn brown. Remove it from the flame as soon as they slightly change the color. Be very cautious while dry roasting the curry leaves. 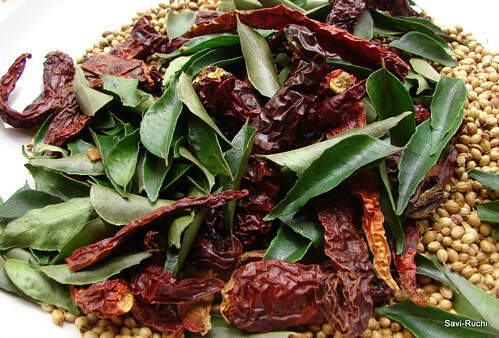 Curry leaves can be dry roasted under the sun. It takes around 3-4 days under the sun for the curry leaves to get dry roasted properly. Keeping it in the microwave is also a good option (I haven't tried it, but read about it in few other blogs). Curry leaves should become crisp (Crush the leaves using your finger, if the curry leaves gets crushed without any moisture, then the curry leaves are crisp to be used for the rasam powder). Allow the spices to cool down. Add asafoetida & powder it in a small mixer jar. Spread the rasam powder on a paper & allow it to cool. Once the powder reaches room temperature, store it in an air tight container & use as required. I feel doddapatre leaves (they look like this ) are underrated considering the medicinal values. Also, visit this link for language translations. 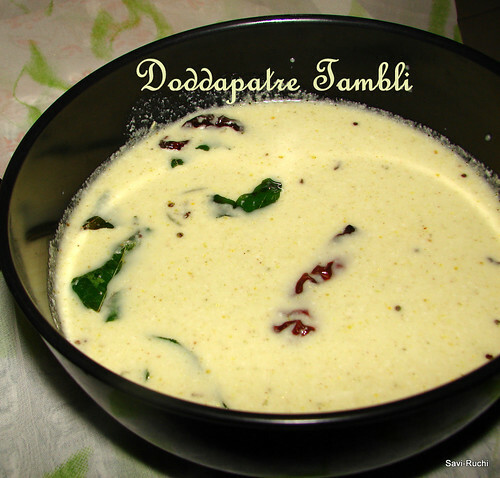 BTW, tambuli is part of Udupi cuisine and its loose translation is yogurt coconut sauce. 1. It has a cooling effect when mixed with yogurt/curd. Hence, this tambuli cools your body. 2. It helps get rid of common cold. These leaves must be heated on a griddle & when they start oozing out the juice, remove it from the griddle & squeeze the juice from these leaves. 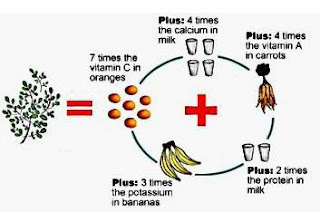 Mix this juice with equal amount of ginger juice + few drops of honey. Give to infants ( more than 6 months old) or young children. It is a very effective medicine. 3. It reduces the phlegm in young children. Follow the same procedure as above, but do not add ginger juice, just the doddapatre leaves juice + honey. 4. It works wonders for constipation & acidity. Consume the doddapatre chutney/tambuli three times a day for 2 days & notice the change. For treating acidity, don't add green chilli while preparing the tambuli or chutney. Avoid coconut too. Prepare a chutney/tambuli with loads of doddapatre leaves. 5. Read in a newspaper that, doddapatre juice is consumed and applied externally against measles. 6. Doddapatre juice helps to cleanse our system. Wash the leaves thoroughly & chop them. Heat oil in a small wok. When oil is hot, add cumin seeds. When cumin seeds turn golden, add pepper & saute for 10secs. Add the doddapatre leaves & saute them till the leaves wilt. Turn off the heat & allow it to cool. Transfer the leaves, coconut to a mixer jar & pulse it until a smooth paste is formed. Scoop out the paste & pulse the yogurt with water for 2-3secs. Add the diluted yogurt/buttermilk, salt to the paste & mix well. Prepare the tempering. Heat oil in a pan. When oil is hot, add mustard seeds, when mustard seeds splutter, add curry leaves, broken red chilli, asafoetida & pour this tempering to the prepared yogurt mixture. Tambuli is ready to be served with steaming hot rice & papad/fritters. I happened to update the picture of bittergourd chips. Have a look at the same here. Happy Shivaratri. May Lord Shiva bless us all. 1. It is given to lactating mothers as it is said to enhance the milk production (rich in calcium). 2. Given to pregnant women, growing children & anemic patients as it is rich in iron. 3. Builds the immunity system of the body as it is rich in vitamin C.
4. It helps overcome malnutrition. 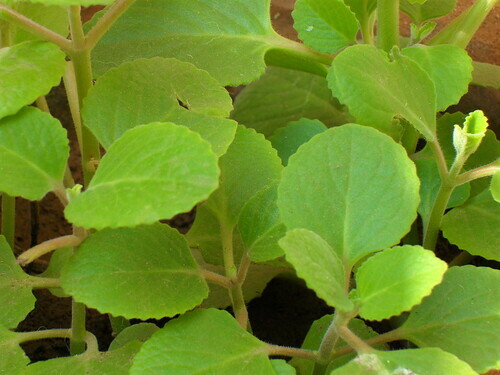 You can find more information about drumstick leaves here & here. Hence, this time when I visited India, I noted down 2-3 recipes using drumstick leaves. This is one of them. Take out the leaves carefully (this takes the maximum time). Though the stem looks sleek, they are not tender, hence it is a must to take out only the leaves. Wash them thoroughly. Soak the dal/lentil in warm water for 30mins. Heat oil in a broad pan, when oil is hot, add mustard seeds. When mustard seeds splutter, add onion & saute till onion becomes soft. Now add, green chillies, curry leaves & saute for 10-20secs. Throw in the leaves, mix well. Add 1-2 tbsp water & cook it on a medium flame until the leaves & the lentils are soft yet firm. Add salt, sugar & mix them well. Cook for another 1-2mins. Add the grated coconut, lemon juice. Mix the stir-fry & serve it hot. 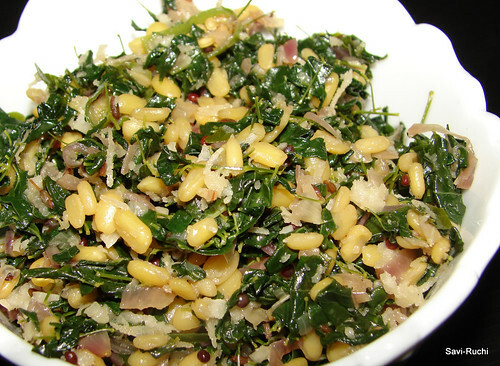 Goes well as a side dish for rice. Drumstick leaves give out a pungent odour while cooking in water. 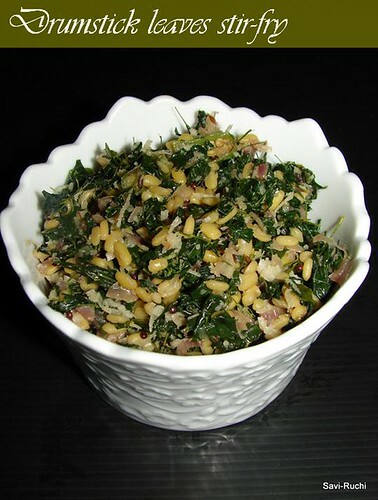 Hence, if your are new to drumstick leaves, add very little water to cook this stir-fry. These leaves are a tad bitter, so addition of sugar & lemon to the stir-fry is recommended. Last note, though I was a bit skeptical about cooking these leaves in a large quantity (because of the odour), we both liked this stir-fry (I cannot say we absolutely loved it). But, I'm planning to prepare this dish more often to get adapted to this wonderful green leafy vegetable. This came as a total surprise.I did neither register for a poll nor vote for winning this Tote Bag. 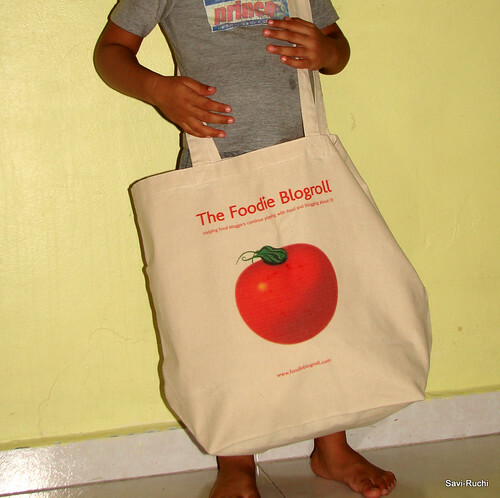 I was randomly chosen from the list of registered blogs at Foodie blogroll. This is the first gift Savi-Ruchi has received so far. I’m really happy & thankful to them. Thanks Asha for the wonderful TOFA (Token OF Appreciation). I have already written about myself here. When I published this recipe using beaten rice, few friends of mine requested me to post mosaru avalakki(Beaten Rice in Yogurt) too. So, this recipe is for them & for all others who are interested. 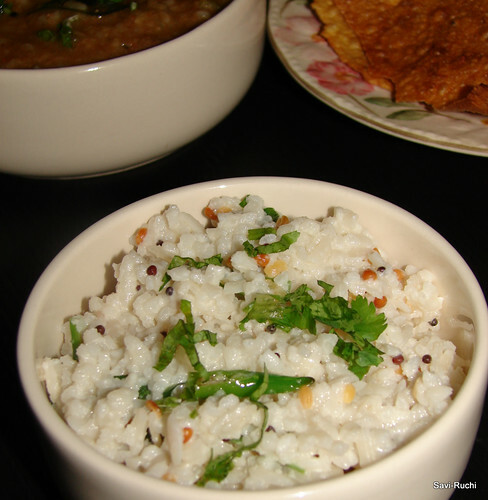 This dish is a “must to-do” on Krishna Janmastami as it is Lord Krishna’s favorite food. Wash the beaten rice in water 2-3 times. Soak the beaten rice in water for 5-8minutes. Drain the water. Add yogurt to the beaten rice & let it soak for another 10-15minutes. By now, beaten rice will become soft & spongy (firm yet). Prepare the tempering, heat oil in a small wok. When oil is hot, add mustard seeds. When mustard seeds splutter, add urad dal & sauté till the dal turns golden.Add curry leaves, green chillies & sauté for another 10secs. Turn off the heat & pour this tempering to the beaten rice-yogurt mixture. Add salt, coconut, coriander leaves & mix well. Chill if needed. Serve it with pickle or papad. To make it more healthy, add some grated carrots, cucumbers or pomegranate seeds.